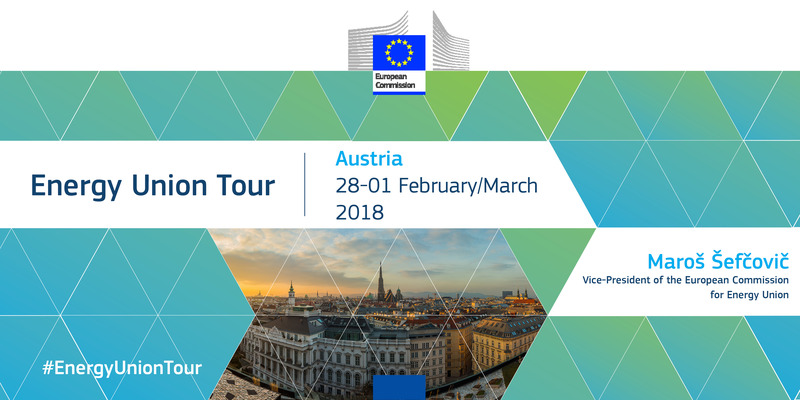 European Commission Vice-President for Energy Union Maroš Šefčovič is in Austria on February 28 - March 1 for the next leg of the Energy Union tour. He will be discussing the EU's plan to help provide Europe with secure, affordable and clean energy. During the visit, he will meet the Federal Minister for Sustainability and Tourism Elisabeth Köstinger, the President of the National Council Wolfgang Sobotka, members of the National Council as well as representatives of Austrian social partners. Their discussions will focus on Austria's progress towards Energy Union targets and its post-2020 national energy and climate strategy, its role in regional energy cooperation in central Europe, and the possibility of using EU funding to invest in projects that will contribute to the clean energy transition. Vice-President Šefčovič will give a keynote speech at the Urban Future Conference 2018 and participate in a discussion on the future of energy and climate with students of the University of Natural Resources and Life Sciences (BOKU), as well as visit the "Aspern Smart City Research" project in Vienna's new district of Seestadt Aspern. Austria is already close to achieving its 2020 renewable energy target of 34% (in 2016, 33.5% of its final energy consumption came from renewables): the current government is aiming for all electricity to come from renewable sources by 2030 (the current figure is 73%) and for a fully decarbonised energy sector by 2050. Austria's high domestic production of renewables has already helped to decrease its dependency on energy imports, boosting its energy security. However, Austria is at risk of missing its 2020 target for energy efficiency; further efforts will be needed to ensure it meets it. I am happy that Austria is already very close to achieving its 2020 renewables target, and in particular that 73% of its electricity comes from renewables: it is a European champion in this area, and we look forward to Austria's plans for 2030. However, it will need to do more to meet its energy efficiency and effort sharing targets, especially in the transport and residential sectors. Furthermore, Austrian energy infrastructure projects have already benefited from the European Fund for Strategic Investments, but there is potential for more, and I also encourage project promoters to make full use of the EU's European Investment Advisory Hub and European Investment Project Portal. As part of the 2017-2018 Energy Union Tour, the Vice-President has already visited the Netherlands, Spain, Slovakia, Sweden, Poland, Lithuania, Hungary, Portugal, Estonia, Belgium, Romania, France, Finland, Luxembourg, Greece, Croatia and Latvia. Upcoming dates and more information on the tour are available here.